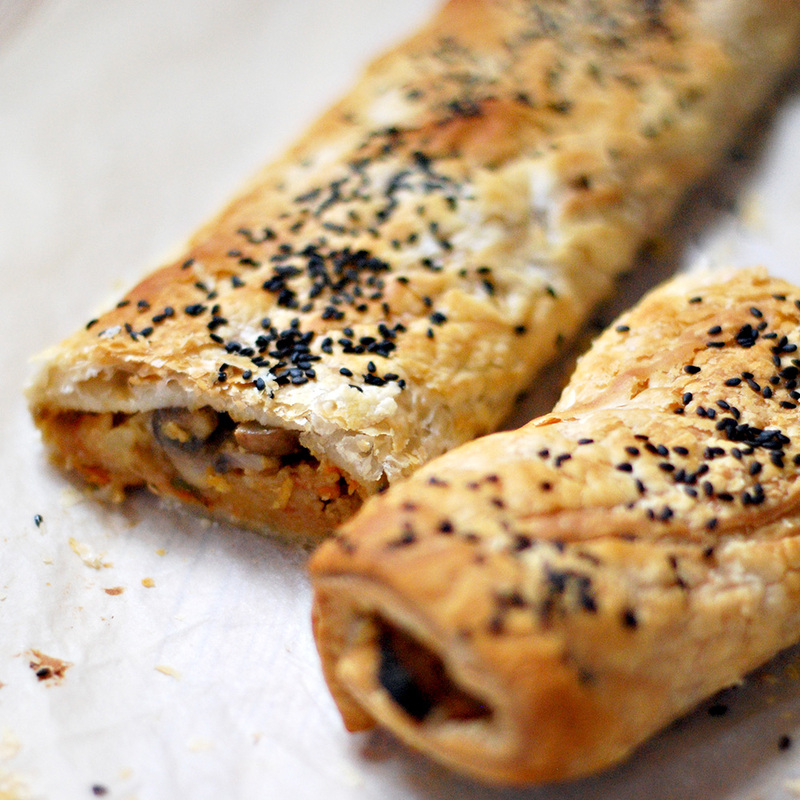 My version of this classic party food it’s off course vegan and have no sausage. What?? I didn’t want to use the readymade vegan sausage that you can buy on the supermarket and went for a healthier version and in my opinion tastier too. This is easy to prepare and you end up with around 20 rolls, perfect for when you have guests or want to something different for dinner. We had it with salad and it was delicious. Ah, this is best served at room temperature. Fry the garlic and onion until tender. Add the mushroom and cook about 7 minutes stirring from time to time. Add the carrots, chives, tomatoes, spring onions, salt and black pepper and cook for another for 5 minutes. Pour the pineapple and keep stirring for another 5 minutes. Turn the fire off and add the breadcrumbs and nutritional yeast. On a floured surface roll the puff pastry out into a large rectangle, then cut into two long rectangles. Place a layer of the mushroom mixture down the middle of each pastry rectangle, then brush each end with melted vegan margarine. Fold the other side of the pastry over, press down to seal and trim any excess. Brush the top with the rest of the melted margarine and sprinkle the sesame seeds on top. Bake it for 30 minutes on a pre-heated oven at 180c. Let it cool and cut each pastry roll into 8-10 small rolls.